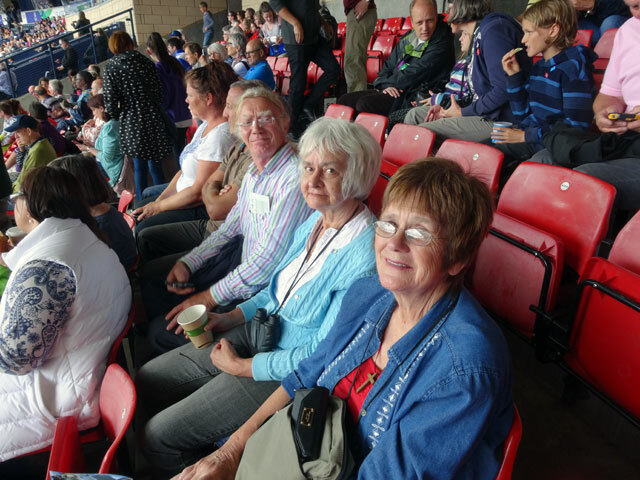 I don’t suppose that we would ever have thought of going to the Commonwealth Games had we not been given tickets by my nephew and his wife as a Christmas present – and an extremely generous present at that. Why wouldn’t we have applied for tickets? I really don’t know. Perhaps because the Borders seems such a long way from Glasgow. Perhaps because of a bit of an aversion to crowds and to being regulated. Whatever the reason, it was wrong. It was a great day out and I am delighted to have been part of it all. We started by walking the dogs and entrusting them to Mum’s care. She was devoting the whole of today to looking after our dogs and Heidi as well because Olive and Digger were also going to the Games. Mum was even missing Church (as were we) in order to ensure that the dogs were OK. The four of us set off for Berwick a little after nine in plenty of time to get our tickets from the machine and board our train at ten. We had reserved seats as far as Edinburgh then caught the regular train to Glasgow. It was extremely busy but we all got a seat. Arriving in Glasgow, we walked the short distance to the Buchanan Street Bus Depot where buses were lined up and waiting to drive us to Hampden Park, all at no charge (well, it would have been included in the cost of the ticket – so thanks again, Nick and Amy)! I was a bit surprised at how far we were deposited from Hampden – it was quite a walk from the bus ‘stop’ to the stadium – but that surprise was nothing compared to that of discovering the length of the queue (everyone, all 44,000 in one queue) which went from the gates of the stadium, away up a road and down the other side and then doubled back on itself more than once. Remember we were two hours early and still we walked miles! 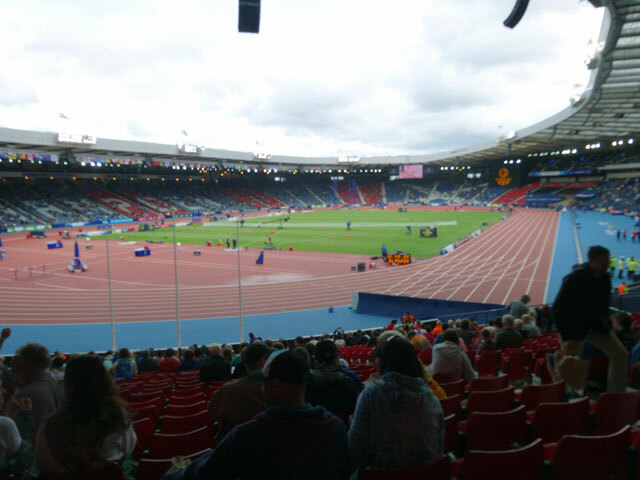 Once inside, there was a massive – and good humoured – security system (just like the airport) and by 1.45, with forty-five minutes to spare, we were seated in excellent seats just above the start of the 100 metres position and ready for everything to start. A final word about that queue. 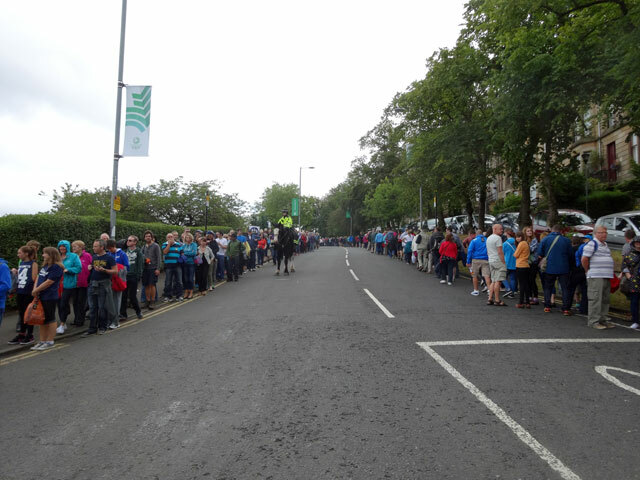 It was actually very well marshalled by police on horseback, who, by ensuring that no one ‘jumped the queue’ at least prevented folk finding an extra cause for discontent. 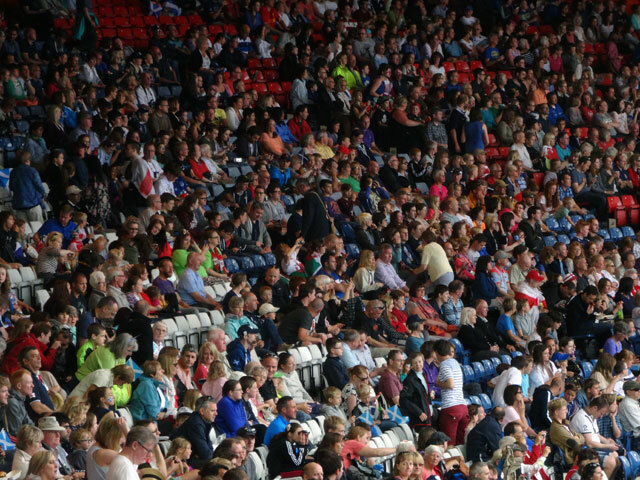 I sat through the afternoon fairly mesmerised just by the experience of being part of such a huge gathering. Announcers kept us informed as to what was going on and provided little entertainments to fill in the gaps between events. These ranged from an interview with Allan Wells, to a sing-along, Karaoke-style, of 500 miles, to a Hampden Mexican Wave. I was fed potato wedges, read my second programme – the first fell into the seat in front and the girl there said it was hers. 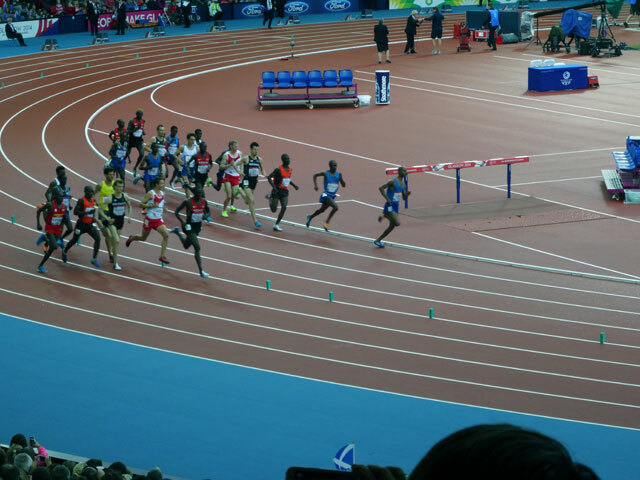 And I marvelled at the athletes. 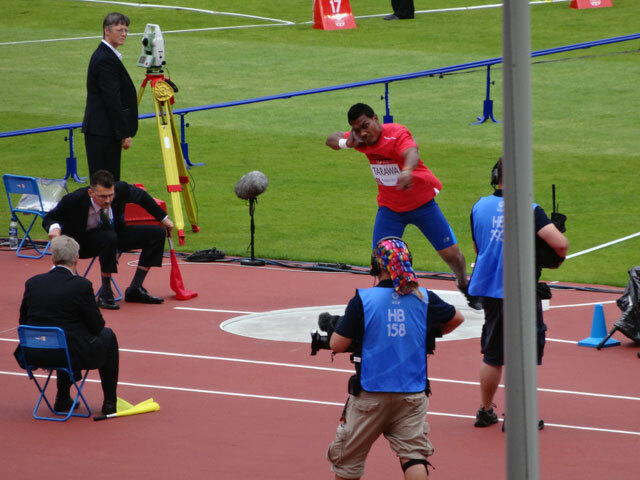 We got a superb view of the shot put which was just in front of us. 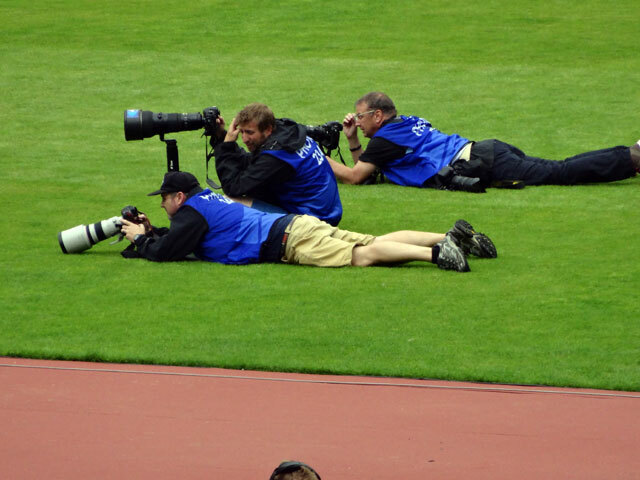 For the long jump I was glad of my binoculars until I realised that everything was also being shown on two very large screens! 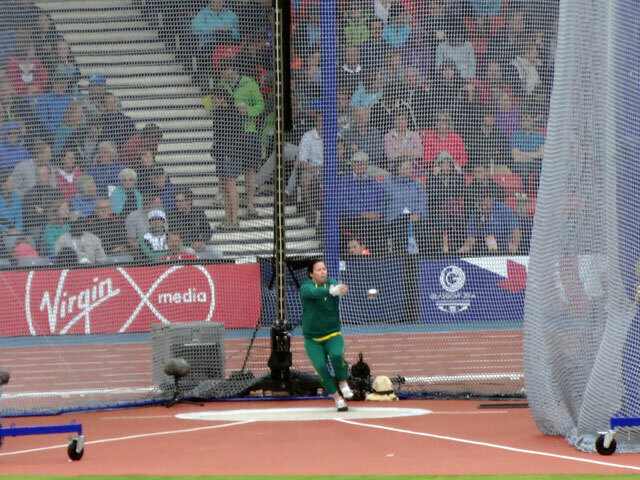 Small things fascinated me: beside the shot put area there was a rail – just as at the ten pin bowling – for the ball to be returned to the competitor. 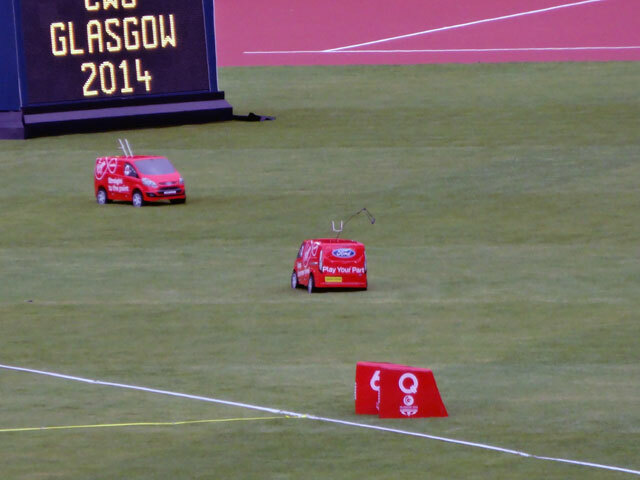 At the hammer there were little battery-operated and radio-controlled cars – just a bit bigger than the ones folk play with in their gardens – into which a hammer was placed and then returned to the start point. 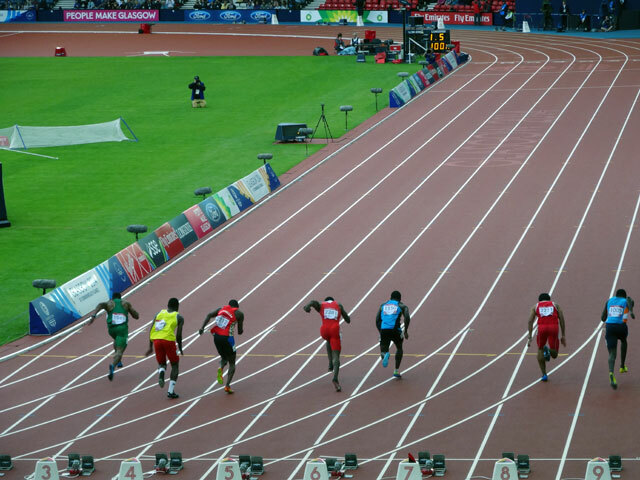 I was awfully vexed for the athletes in the 100 metres who were disqualified for a false start. 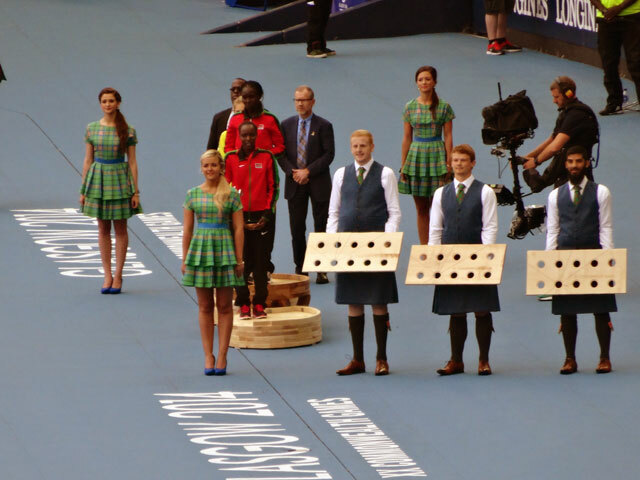 Imagine coming half-way around the world to run in this once-in-a-lifetime event and getting stopped on the starting-line? 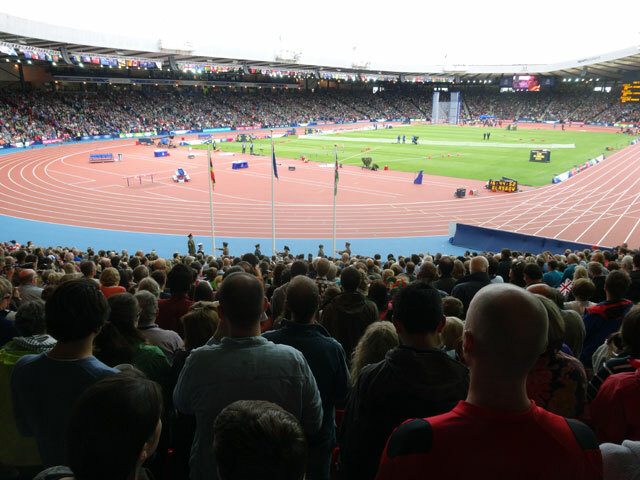 With few Scottish athletes on show today, it seemed to me that the crowd was keen to shout on the under-dogs, never more so than for the Solomon Islander, Rosefelo Siosi, a seventeen year-old who struggled around the 5,000 metres being lapped at least twice by some of the more elite competitors. There was a bit of a difference between the attitudes of the organisers who, for example, only announced the names and introduced the very ‘best’ of the runners, and the crowd who cheered on those who were less ‘elite’. I thought that it was a shame that everyone wasn’t introduced, but what would I know? 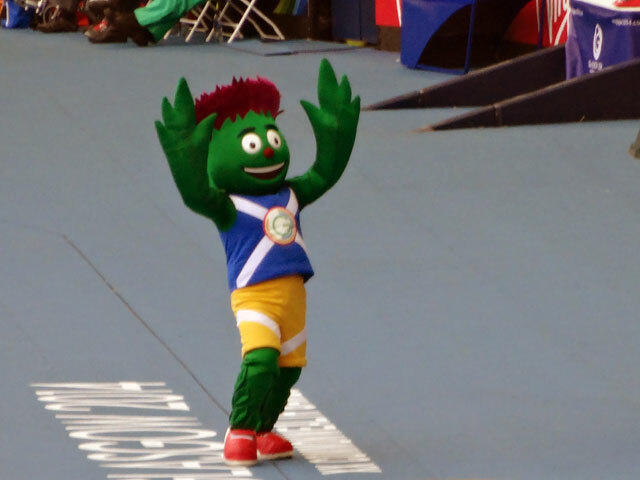 What I do know is that the atmosphere was superb – it was wonderful to be part of such a happy, excited crowd – Glasgow was on show and she was preening like a peacock and really strutting her stuff. We left with a train to catch and in the middle of a huge crowd as we made our way back to the shuttle bus-stop. This time there were no police officers to keep order and the crowds were chaotic. And this time there were no buses – just a frantic official trying to conjure up buses on his walkie-talkie. Normally this would be great fun – but there are limited trains to the Borders on a Sunday evening! We reached Glasgow Bus Depot, walked to the railway station to be greeted by a half-mile queue right out of the station and around the block for a train to Edinburgh. The queue moved quite quickly and we boarded a train and arrived in Edinburgh at 8.10 – just ten minutes after our train to Berwick had departed. However, all was not lost, there was another at nine and the lady in the ticket office endorsed our tickets for that train and allowed us to travel on it at no extra charge. 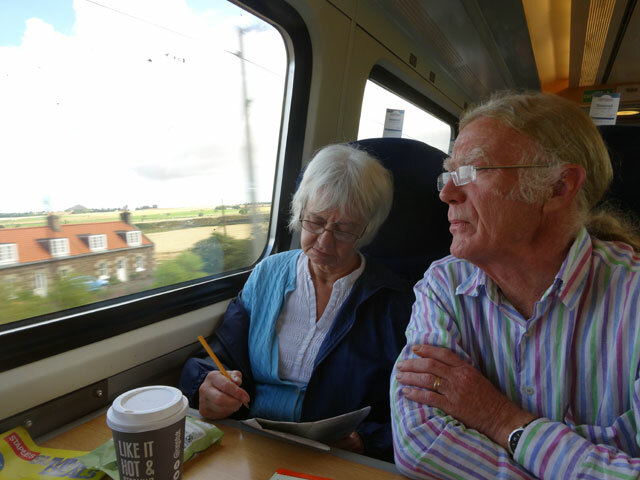 We travelled in comfort and were home at a little after ten having had an excellent day. Mum had coped well with the dogs who were all alive and happy. Tom and Dorothy had popped in to see that she was OK – she was fine. We were grateful. Soon it was off to bed. We have an early start tomorrow.